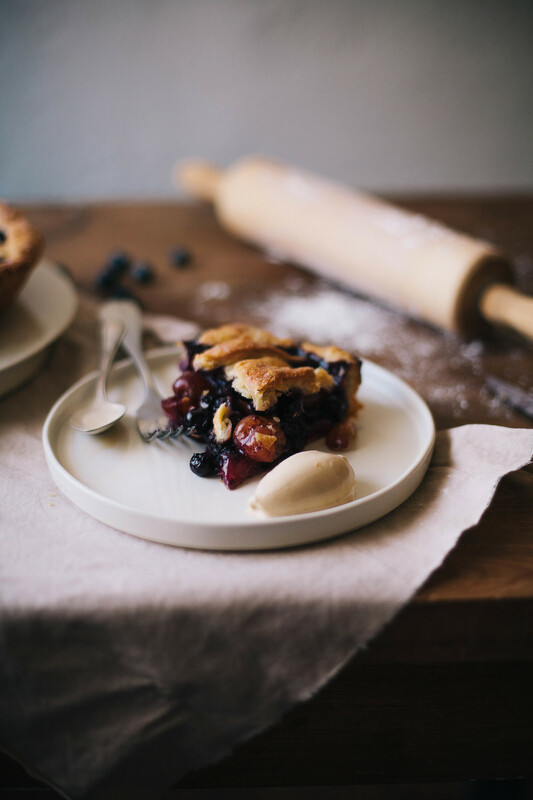 Blueberry Cherry Pie — always with butter. Mix flour, sugar and salt into a large bowl. Toss butter in flour mix to evenly coat. Quickly, use your fingers to rub the butter into the flour to create a shaggy dough. Having come flat, thin pieces and large and chunky pieces of butter in it. Drizzle the liquid over the dough. With your hands, toss all together until evenly distributed, will still look a bit dry. Press into a ball, either in the bowl or on the countertop. Just press in any shaggy edges. Divide into two and press into flat disks. Wrap in plastic wrap for at least 1 hour (up to 5 days). 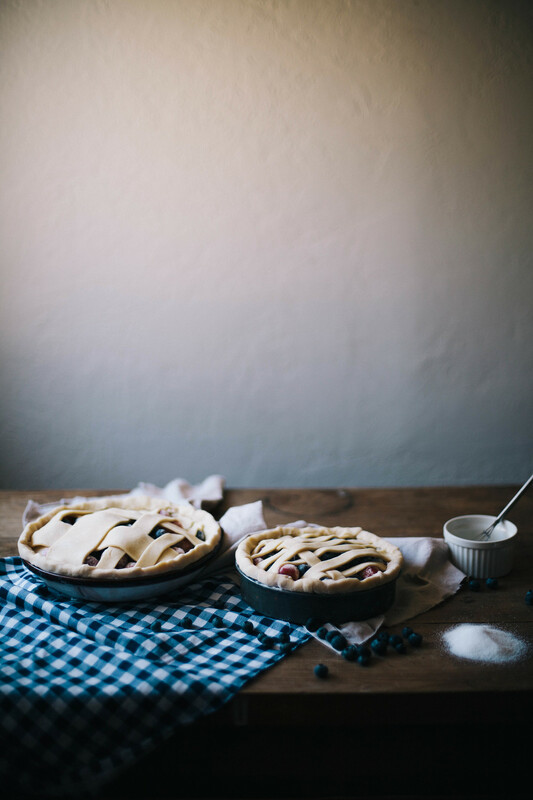 I never measure out the fruit when I'm make a fruit pie. I only measure it out by filling up the tin until it's very full, before I start with the crust. Then I pour it out into a bowl and sprinkle with sugar and cornstarch. Don't actually measure those either.. just enough to coat the berries, more or less sugar depending on the sweetness of the berries. Combine the ingredients and set aside until ready to use. Roll out the second disk to the same thickness and the bottom layer. Depending on what design you want on top will dictate the shape you roll it. If you want to do a completely covered top, roll it into the same circle. If you want to do a lattice pattern, roll it more square and cut into strips. If you want to do small layered cutouts of crust, the shape doesn't really matter. I decided to do a kind of abstract lattice. 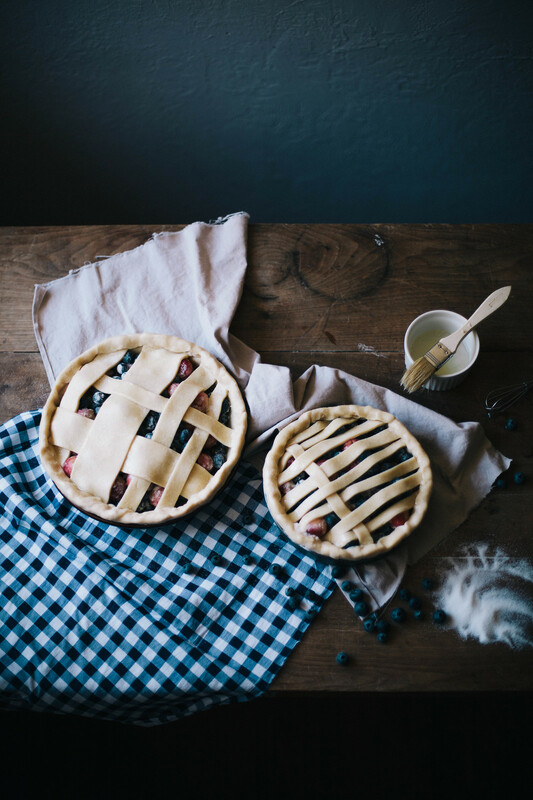 Take the dough-lined pie tin out of the fridge and fill with the berry mixture. Brush the edge of the crust with the beaten egg and layer strips of dough over. Trim any strips that are longer than the overhang of the bottom crust. Fold over the overhang of the bottom layer, encasing the top strips and pressing in slightly so they stick together. Cover with plastic and chill for 20 minutes. Remove from fridge and remove plastic cover. Brush the top with the rest of the beaten egg and sprinkle with coarse sugar. Place on a baking sheet and into oven. Bake for about 1 1/2 hours, until top is a deep golden brown and juices are bubbling. Let cool for 4 hours.